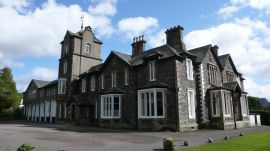 Treasure: A Retreat for all young people of High School age and Above..
Castlerigg Manor is the Lancaster Diocesan youth retreat centre with a rich history of working with young people over the last 50 years. It is hugely popular with schools and groups of the Diocese and beyond, and is usually fully booked a year in advance. We have been fortunate enough to secure this time during half term for our retreat. It is a fantastic place with a games room, lots of outdoor space and spectacular views! Of course, there is also a beautiful Chapel as well as lots of bedrooms, showers and toilets, and a dining room. This retreat is a great opportunity for our young people to escape from the day-to-day routine of life. Time away gives us a chance to re-evaluate where our lives are going, to reflect and learn about ourselves, each other and about our relationship with God. As well as lots of exciting ways of exploring our theme through games, workshops, group work and prayer we will also enjoy some time outdoors. There will also be plenty of time to relax and socialise. £100 per person. This includes all accommodation and input as well as food and travel. We appreciate that this is a big cost especially for families where there may be siblings who wish to attend. Please see the Fundraising PDF for details of how you can help reduce this amount. We do not want anyone to miss out so please talk to us if you have any concerns. We will be leaving St Clare’s at 11 am on Monday and will return again to St Clare’s on Wednesday at 6 pm. The Retreat will be led by Joe and Ruth White and Nora Lord from Metanoia Project who lead the ‘Seekers’, ‘Anointed’ and ‘Sent’ youth groups. We will also be assisted by our fantastic ‘YOKE’ Young Leaders. See the fun we had on last years Autumn retreat. If you are interested please download leaflet and fill in this reply slip and return it to Joe and Ruth White at Metanoia Project as soon as possible and no later than Sunday 7th October 2018.